a twist of fate perhaps? So things are actually looking more hopeful this week than last week. I think that the stress of the Special Education (SE) process combined with the post-vacation come down were making me depressed. It also helped that I got a call from the admissions director for Discovery Woods school. She had seen my post on the Natural Families NOVA yahoo group asking about Reggio Emilia schools in the area. I love the school but had believed they were full for the semester. It turns out they have one spot left, and Kaio would be the perfect age for it! I spent an hour and a half on the phone with her explaining Kaio's personality, strengths, and the SE ordeal. Everything she said about the school sounded perfect. Actually everything she said sounded exactly like things I have said or thought. Like that little boys this age should not have to sit at desks, that kids should be outside playing with nature and using their imagination instead of indoors with toys, and that a small loving home-like environment makes kids more comfortable. Just to name a few. I was just smitten and energized. So I really hope that Kaio likes the school and that they think he will fit with the community. The kids eat grass fed beef and veggies from the school's garden for lunch! how cool is that? We are going to an open house on Friday afternoon to see the school. The open house is for one of their homeschooling classes, but she said that I can still get some info and meet them. Mari, Kaio and my mom are all coming. So that's cool. I did go back to the SE office and complete the IEP with some modifications to what was written. I'm comfortable with the goals now and I think that it could be good for him in tandem with exposure to kids his age. But I let them know that if things work out with Discovery Woods, I will probably change the IEP again. They said that was fine, no hard feelings. They were also really excited about the school. I've been depressed. Mus be from the mix of readjusting after a long road trip and dealing with the special education process. I didn't do anything at work this week! I mean that I did the absolute minimum I could possibly do to tread water. I probably worked a solid 4 hours all week. Pretty pathetic considering I won an award for being so extraordinary last year. But my boss was out for a wedding and surgery, so it was easy for me to not work hard. Every day last week I was either visiting the Special Ed program or visiting a preschool. I have not stopped thinking about Kaio and his future all week. I'm obsessing and it's draining. Nothing seems right. None of the schools seem like a fit for him. And I can't help but worry that there is something wrong with him, even though he seems ok to me. I don't know what any of this means in the long run. Will he grow out of it, or is he crazy? Will he be disadvantaged if I do A or B or C? Why don't the 'professionals' agree with me that he is fine? If the system finds him as 'special,' then maybe I don't want to be a part of the system? I'm so freaking confused. I went to the best and most expensive school in the area: Nysmith School for the Gifted. It is a wonderful place filled with natural light and programs based on discovery and creativity. But their preschool program seemed heavy in the arts and crafts. The math and science activities were painting and mixing with colors and counting windows on a bus. It seemed like they were incorporating learning into fun activities. But, I'm just not sure that Kaio would consider those activities fun. I would much rather see him out in the real world counting butterflies or times that a rock skips across a pond, dropping sticks and leaves into the water to see what floats. I just don't jive with the craft activities. I want the kids to be outside. Nala has a book with feel and touch baby animals: fluffy chicks, rough baby elephant ears, furry gorillas. what's with the book? I want them at the zoo, touching the animals. And that has really been the basis of my two days at home with them: let's get outside and see the world. Kaio will tell you all about how bees make honey by pollinating the flowers and going back to their hives. He knows that the honey is sweet and he eats it. He knows that the flowers come from seeds, water and sun, and that birds like to eat the seeds. He knows that caterpillars turn into cocoons and then butterflies. Birds come from eggs and make nests. He knows when people are happy, sad, mad, surprised, etc. He knows how to interact with the natural world around him. To me these things are more important than spending hours sitting at a table cutting and gluing. I just can't imagine him sitting still at circle time in a classroom with the other kids. And I don't think that I want him to have to do that. I know that teachers keep saying, well he'll have to do it when he goes to school. But then maybe I don't want him to go to school. Seriously, I look at those desks all perfectly aligned and I think of some communist culture. Why do kids have to line up in a straight line to walk to the lunch room? There is nothing natural about that. We are creating a submissive society. Sure I have problems with authority. I think I'm above the law, the rules, the process, I don't have to read the instructions, etc. I am constantly finding ways to stand out in the crowd and it really hasn't turned out so bad for me. I think it is part survival instinct and I hope that Kaio inherits it. I think he has. It must have come from my grandfather, one of the few who escaped from communist Romania. He and Kaio had an unspoken connection in the year they spent together. I know that I am sounding completely crazy right now. But I'm really getting a dirty feeling about school. I'm also just freaking out because I don't know the 'right' thing to do. I wish there were more Regio Emilia style options in the neighborhood. The one school that I know of is full. All this worrying about how bad his life will be if i don't get it right is really eating at me. We had two more events today in the Special Education saga. This morning we visited a Montessori preschool close to my work. Kaio was very intrigued by the classrooms full of kids. He wanted to peek through the windows and crack open the doors to see what the kids were doing. The school seemed huge to me. It had 5 classes of over 20 students each. I could tell that he really wanted to be with the other kids, but was nervous to talk to them or enter in the classrooms. He is very outgoing when there is just one kid around. But more than one kid and he becomes timid. We left the school and I felt like the signs point to him wanting to join a preschool, but not that one. 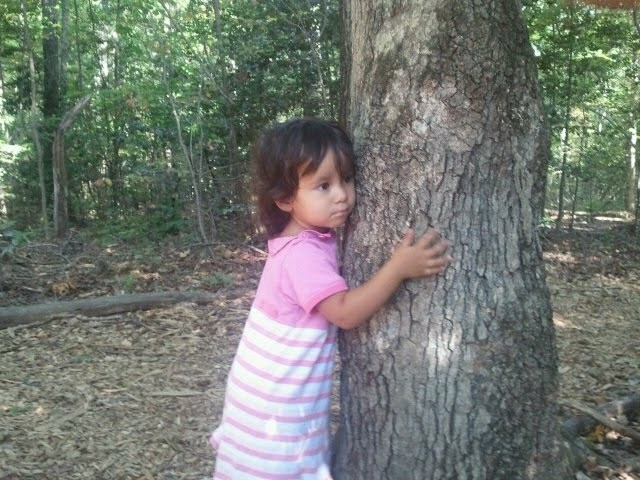 After the Montessori visit we went to the Walker Nature Center in Reston for a walk in the woods. Kaio remembered immediately that this was the same place he had rode his bicycle before and he started begging for his bicycle. I was able to calm him down by explaining that it didn't fit in my car, and this time we don't have a bicycle, can we still take a walk without it... etc. We took a walk to touch and see nature. The kids both liked picking up interesting rocks and acorns. Nala started filling up a little purse with acorns, and Kaio asked if he could take some rocks home with him. I think next time I'll bring some little bags for them to stow interesting finds. We has a fern tickle fight, and Nala hugged her first tree. In the afternoon I went back to the Special Education office for their recommendations on where to place Kaio and his Individualized Education Plan (IEP) while the kids napped. As I predicted, they recommended that Kaio attend a minimum 3 days a week in the mornings. The problem that I am still struggling with is how the class does not have kids his age. Even when they will get 'normal' model kids from the community in November, those kids will be 3 years old, not 4 years old like Kaio. The idea of free daycare is really enticing. But I keep thinking of how Kaio reacts to being pressured to learn things. He ignores the questions and tries to get out of the situation. I observed this when we visited the classroom. He was playing with a train set and the teacher kept pushing trains in his face and asking him to pick the yellow one. I know that he knows his colors but he just didn't want to answer her because he was not interested in the question. I think that he understands that people are pushing him, and he rebels from that. I was the same way as a kid. When my grades fell in school I remember feeling like I wasn't satisfying my parents. When they started sending me to psychologists to figure out what was 'wrong' I resented them for not trusting me to be me. Public School classes did not interest me. I used to read books under my desk during class. It's not that I was a bad student. I did really well in college, and now I do great at my job. When I asked the SE teacher about how he would meet his goals on socialization and communication without peers to socialize or communicate with, she said that most of his goals are measured through adult participation and prompting. So adult coaching will help him and he can play with other kids in settings outside of the SE class. I am contacting a Farm School that has afternoon preschool to see if that is something that he can do in tandem with the SE. I think that is the only way that I will feel comfortable with this change. But even then, I keep shuddering as I picture that teacher pushing the trains in his face and saying. "Which one is the yellow one. Kay-o?" As he is peacefully constructing his railroad track and talking about the train scene. Shouldn't I just let him be a kid? When I started this whole process, he was at a place where he seemed sad, withdrawn and slightly vacant. But now-a-days he is so happy and social. He is progressing with speech in both English and Portuguese. Today we went to the gym and he walked into the kid's play area without fight. He took his shoes off and went to play with the big room full of older kids. I peeked in a couple times and he was constructing legos with some other kids and talking to them. So I just don't think there is anything wrong with him. Until I start comparing him to other kids. Then I see that his sentences are not as perfect as there's are. I see that he erupts with frustration and cries more frequently. But I'm not supposed to compare to other kids, right? OK We are back from our two week family road trip and life much improved from my last post. I think that acknowledging the difficulties helped me switch gears to Carpe Diem. That particular day did get worse before it got better, as we discovered that I accidentally left Mari's wallet in a gas station in Mulan, Idaho: three hours behind us! That would equal an added 6 hours to the trip, which is over a half day of driving. Luckily with today's smartphones I was able to find the phone number of the station, call, and convince Joe of Joe's Station to mail us the wallet. That made Mari feel a little better. We took turns driving at night for the next two nights and ended up having time for a couple decent and fun pit stops along the way. One of my favorite stops was at the Kohl Children's Museum. Who knew Chicago had so many cool things going for them? The kids loved it! They played like crazy straight through nap time. All of the exhibits are hands on interactive. There was one exhibit devoted to music with a number of multi sensory toys, including a room with music playing that projected your image with trails on a giant projector. It was exactly the kind of multi sensory situation that Kaio normally runs away from. But being in the kid's museum amongst so many fun activities he did give it a try with some coaxing. The whole family shook out booty to the beat and watched the pretty rainbow patterns morph to the rave music. There was another exhibit made up like a pretend grocery store. Nala went in and packed her cart with fruits and vegetables. When Kaio went in, he B-lined for the bakery and filled his cart with every bagel and bread product in the store. What does this obsession mean? Is it because we are repressing gluten from his diet? I've not sure how to interpret this. So then we made it home happy and healthy. I think the kids really liked having all the one-on-one time with us in close quarters. We got along well. There were a few difficult times getting the kids to stay in their seats and follow directions. But we would of had difficult moments no matter where we took the vacation. I will try to post later with more highlights from places that were successful with the kids. Since we have been back Nala got kinda strangely struck with a vaginal itch a couple nights ago. She couldn't sleep until 3am because she was itching up in 'there'. But no rash or discharge. I couldn't figure out what was wrong with her. It didn't seem like a yeast infection, or a UTI, and no sign of worms. Finally she fell asleep on my belly at 3am. She has been fine since then. So odd. Please let me know if anyone out there has any ideas. I googled but found nothing. Today we had an appointment to visit the Special Education Pre-School that Kaio might attend. I'm still not sure what I think of all this fuss over his latent speech development. When we got there he was talking up a storm to the teacher. He took her hand and pointed out all the things that he was seeing around the school, "owl! wolf! look kids!" The teacher said, "He seems really different from his file." Yes just another mixed signal that I'm getting about whether he really needs 'special' education. Sure he talks a bunch sometimes, but he rarely responds to direct questions. Actually Sunday was a first when I asked him to tell Grandma Helen what types of animals we saw on our road trip and he actually responded by naming animals. Sure the first one was 'elephant' (which we didn't see) but maybe he did see one somewhere. The rest of the animals were in line with the trip: deer, elk, buffalo, a cricket. So I was really impressed that he answered a question about something in the past that was not related to trains. It was a milestone! He learned how to use a computer mouse and for the last few days has been doing Thomas activity games on the internet, like coloring and matching games. My mom got him tangrams, which he figured out immediately. So he is pretty good at spacial thinking. I'm just not so sure what to make of all of this. I don't think that I want to put him in that Special Ed preschool. There are only two other girls in the class and they are both younger than him and gross motor skills challenged. I know that he will get tons of personal attention from a professional special education teacher, not to mention FREE pre-school. But I just don't know if he will be happy in a class without peers. I want to explore Montessori and other preschool options to see if maybe a different learning approach would be better for him than the in-home daycare that he is at now. I also went to a cranial dentist appointment today where the holistic dentist gave me the results of my biometric exam: x-rays, MRIs, measurements of my facial alignment, jaw range of motion, and tooth molds. My teeth curve inward instead of outward like everyone else's because my childhood dentist removed four of my permanent teeth to prevent overcrowding before braces. This is causing daily trauma, and also makes my bite so screwed up that my teeth don't touch when I close them. Really, other people's teeth touch? apparently so. I put the $2K down payment on a piece that will begin the process of correcting my bite. I'm also getting the rest of my mercury fillings removed in two weeks. I am so excited about this! It is a major financial decision. But hopefully insurance will pay back some of the cost. And I have faith that it will resolve my neck pain. So basically I have been out and about this whole day, even though I was supposed to be back at work. I better get a lot done tomorrow to make up for it. In surprisingly good news, I found out over the vacation that I won an award at work for doing such an excellent job over the last year. I can't believe that they are giving me an award when I feel like such a loafer taking off two days a week to hang out with my kids. I guess they really do like me, and it is nice to feel like I'm good at something even though it isn't exactly what I want to be doing with my life. Isn't it ironic?